This Post Brought to You by the Letter "e"
It’s funny how we take things for granted. Putting one foot in front of the other, feeding ourselves without dropping everything on the floor, reading, writing…these are all things that we know how to do now, but can’t remember ever learning. We just do them. Well, when you’re a kid, these things are like learning ten languages at once. I never really thought about it until I started teaching my daughter how to write her alphabet. Sure, she’s learning these things at school, but I’m a firm believer that these lessons need to be reinforced at home. So, over the summer my now four year-old and I took on the mission of learning to write her name. Let me tell you, it has been a lot harder than I thought. I mean, how hard can it be to look at a letter and then imitate it over and over again? Well, it’s hard. Really hard. I have to say I am lucky because my daughter actually wants to learn and thinks its fun. Oh yeah, she is my kid! So, almost everyday over the summer we practiced writing her name over and over again. I can honestly tell you she improved each and every time. We kept looking back at her old writing and we could both definitely see the difference. By the time school started earlier this month, we had her name done…all except that pesky “e”. Big “E” was easy, but his little brother proved to be a pain in the alphabet. No matter how hard we tried or how much we practiced there was just something about it that stumped my daughter more than the hardest “Where’s Waldo” picture you could find. 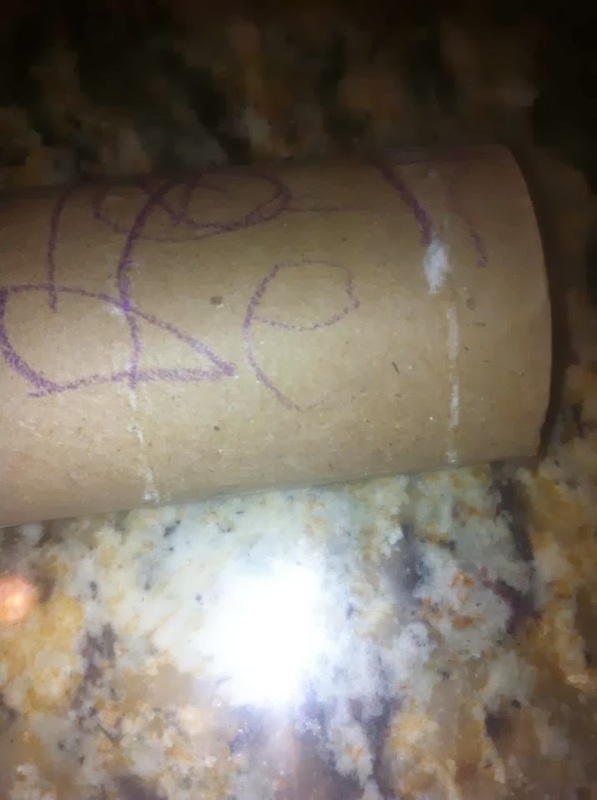 But that all changed a few nights ago when she picked up an empty toilet paper roll. You see, one night after bath I changed the toilet paper roll and she took it to play with so she could be a pirate. After a few minutes of looking for treasure, she took it into her playroom. I was in the kitchen when all of a sudden I heard, “Mommy, you have to come here and see this.” Inside I was thinking, oh no, what happened now? Is there more crayon on the wall? Did Barbie lose an arm? Thankfully it was none of those. Surprisingly though it was the letter “e” written pretty nicely in purple crayon on the empty toilet paper roll. “I did it, I did it!” My daughter yelled loudly, beaming with pride. She knew the pesky “e” was that summer fly we could never get rid of. But that night, she swatted it. I was so proud! I felt like our hours of practice really did pay off. I don’t know what happened, but something must have clicked at the moment allowing her to write that “e”. She was so excited. She brought it to school the next day to show her teachers. I believe now it’s on a bulletin board in class! At least, that’s what she told me, although I haven’t seen it yet! If you visit my blog often you know I usually write about the adventures and misadventures of my two little girls as well as parentingisms that really irk me. While that’s all fine and dandy, I’m kinda going off the beaten path today. Recently I’ve read and heard about so many people taking leaps of faith in their lives that it really got me thinking, which in turn inspired me to write this post. We’ve all heard the clichés like “we only go around once” or “you only get one life, so you better live it”…etc. I’ll admit those get so annoying to hear because we all know we have bills to pay and responsibilities to meet which makes it impossible to live our dreams of becoming bartenders on a tropical island. Someone used to tell me all the time “find your passion”. I always thought it was a weird thing to say to someone, but over the past couple of years, I’m beginning to understand. Everyone has that “something” in life that puts a smile on their face no matter what or motivates them to the highest point. I think we all know what “it” is but are too afraid to pursue it many times. Usually it takes some kind of tragedy for people to really open their eyes to what is important to them. So, it’s refreshing to hear about more and more people seizing the moment now before it is too late. With all that said, there are so many people who are giving up their jobs to follow their passions. Whether it be teaching yoga, moving to a foreign country, or becoming an entrepreneur, they are making the decision to just do it. They are throwing the typical “9-5” stuff aside to do what they truly enjoy. That takes a lot of guts and faith if you ask me. I’d like to think I took a mini-leap of faith two years ago when I quit my job to stay at home with my kids. Sure, I could have sent them to daycare, but I didn’t feel comfortable doing that. I’m sure many people thought I was crazy to leave a job I was good at with a decent salary to stay home. I thought I was a little crazy too! Truth be told though, my heart wasn’t in my job anymore. Many days I felt like I was just going through the motions. I was truly happy when I was with my family and when I was writing what I wanted to write. So I’ve used my time to start some writing projects that I will hopefully be able to share in the future as well as take care of my family. I would be lying if I didn’t admit there have been a lot of up hill battles and adjustments, but I’ve just kept climbing the mountain every time I’ve slipped. That’s what happens when you take a leap of faith. You have to expect some bumps along the road and just move on without looking back. I’m sure many people who’ve chosen a different path realize it’s not always sunshine and roses, but I think it’s better than not trying something new at all. Don’t you? You can always fail, but at least you won’t have regrets. I think those are the worst. So take a leap of faith, step out of your comfort zone, even if it’s only to try a new food or nail polish color! Baby steps, baby steps…who knows…they may lead to bigger and better things you could have never dreamed. Guilt. The dictionary describes it as “feelings of culpability especially for imagined offenses or from a sense of inadequacy”. Hmm…that’s a lot of fancy words…none of which my four-year-old understands. But, don’t underestimate her. She may not get the standard definition, but she sure knows how to make you feel guilty, or in four-year-old terms…poopy and sad. Here’s the story…I recently went to visit a friend out of state to catch a concert. I know, such a horrible mother! My younger daughter was oblivious to my plans, but I wasn’t so lucky with her sister. You see, my older daughter could work for the FBI. Just like any child her age, she asks tons of questions and demands answers. She asks what we’re doing days before I even know. So, when she asked what we were doing on Thursday, I told her where I was going and that I wasn’t going to be back until the day after. Well, cue the dirty looks and inquisition. “Why do you have to go? Why are you coming home tomorrow? Where are you going to sleep?”…I could on and on. She didn’t like any of my answers. Fast forward to Thursday morning when she asked again what was going on, knowing full well the plans for the day. When I “refreshed” her memory…she said, and I quote, “Well, I’m not happy about that at all.” I admit, I laughed because I did not expect her to say that at all. The time before I left was filled with plenty of tears and “mommy don’t go’s”. I felt like someone just handed me a one way ticket to mommy guilt island…minus the fruity drinks and tiny pink umbrellas. I truly did feel horrible and like I was doing something wrong. But then I thought, when was the last time I truly did something like this? Answer: A couple of years. I think I was overdue, but that still didn’t squash all the guilt I felt. So, after lots of hugs and plenty more tears, I left. I felt like the worst mother in the world. Of course I checked in from time to time, only to find out there were several meltdowns while I was gone. I also got the phone call of tears and “I miss yous”. Of course I missed them too, but I was having a good time. I knew she and her sister were in capable hands and were going to be fine. I knew they were going to miss me, but I also knew they have to learn that mommy sometimes needs time away. I thought a lot about how I was feeling during my drive alone…without twenty questions and constant arguing and whining. Why do a lot of us moms feel so guilty when we take time for ourselves? And by time, I don’t mean time to fold clothes or unload the dishwasher. I mean time away doing something fun. It’s pretty stinky if you ask me. I doubt many fathers feel this way if they go watch a game or play a round of golf. So, why do we? Maybe it’s something that goes along with having a uterus. Who knows? Whatever the case, I wish I didn’t always feel so darn guilty! Anyone else out there feel the same way or is it just me? There were plenty of hugs and kisses when I got home. They missed me and I truly missed them. But, there’s nothing wrong with a little mommy time, even if does come with a complimentary guilt trip.